Dinocephalosaurus is a genus having long neck. These are found in the Triassic seas many billion years ago. The name Dinocephalosaurus means terrible headed lizard. 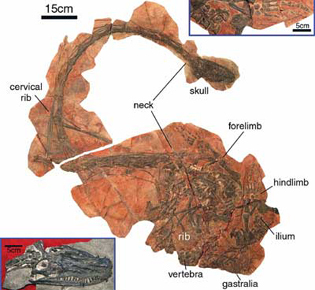 The skull of this specimen was known to be discovered near xinmin in Guizhou province. Later in the same place another specimen with head and the postcranial skeleton without tail has been found. First record of discovering this specimen was carried out in China where not only the specimen of this dinosaur, but the specimens of some other dinosaurs were also found. Dinocephalosaurus is known to have belonged to animalia kingdom, chordate phylum, reptilian class, archosauromorpha infraclass, prolacertiformes order, tanystrophidae family and dinocephalosaurus genus. Dinocephalosaurus has a minimum of 25 cervical vertebrae making the neck long to approximately a length of 1.7m where as the body is approximately 1m. The long neck in the Dinocephalosaurus is used to capture the prey. Dinocephalosaurus is different from the other protorosaurus as it is fully aquatic, but it lays its eggs on the land. Dinocephalosaurus retain the juvenile characters even in the adult stage. This means that it will retain its character even after it grows. The studies on the Dinocephalosaurus revealed that the Dinocephalosaurus lived in the shallow murky water of the sea. It is believed that the Dinocephalosaurus take fish and squid as its food. As the Dinocephalosaurus lives in the shallow water its long neck allow it to approach the prey easily. Dinocephalosaurus has a unique strike capability that by flaring its cervical ribs by creating a vacuum it can increase its esophagus volume. All the cervical ribs are articulated near the anterior end of the cervical vertebrae this makes it to have pronounced transverse processes for muscle attachment which helps to flare out its cervical ribs. This makes the Dinocephalosaurus to prevent the creation pressure wave by which the fish will get alerted. And the Dinocephalosaurus can grab the prey and it is possible to hold it with the fangs on its upper and lower jaws. It is believed that the Dinocephalosaurus is able to swallow the whole prey which it captures. According to studies and researches, the Dinocephalosaurus stays in the shallow murky water and the entire body is being rested in the water. And the neck of the Dinocephalosaurus is swiftly lifted over the water and it strikes the fish which pass over and it captures the fish. The researches state that Dinocephalosaurus is a poor swimmer. The flattened torso, and the skull having the eyes on the top of its head and the upward curving of the snout are the remarkable features which make the Dinocephalosaurus to have a lie in wait style of capturing prey.